Self-catering beautifully presented gite available for rental throughout the year. Situated in the romantic town of Brantome known as the 'Venice of Perigord'. It is liberally appointed with cafes and highly recommended restaurants including the Chabrol, Moulin de l'Abbaye and nearby Moulin du Roc reported to be the finest restaurant in the Dordorgne. The 11th Century Abbey with the oldest bell tower in France dominates the town and overlooks the River Dronne. The area has many attractions to offer including the nearby villages of Bourdeilles and Villars boasting the Chateau de Puyguilhem, and the prehistoric caves Grotte de Villars. Many Chateaux can be found around Brantome, a visit to Google earth highlights the delights of this area of France. Brantome holds its own street market on Fridays offering local cheeses, wines and fresh veg etc, the largest market in the Dordogne can be found at Piegut Pluviers. A day trip to the vineyards of Bordeaux is well worth the effort. BRANTOME: Brantome boasts some 22 cafes and restaurants to suit all tastes from the french traditional 12 euro lunch to the 150 euro lunch at the Moulin d'Abbaye. Canoeing can be enjoyed on the river Dronne, either by taking a trip around the island of Brantome or by canoeing down to Bourdeilles. One can also travel upstream and canoe back to Brantome at one's leisure. There are numerous walks around the area, from 3 kms to 15 kms which take you through the beautiful countryside surrounding Brantome. Most amenities are available in Brantome and Brantome boats probably the best Bounlangerie and Boucherie in the Dordogne. The caves behind the 11th century Abbey are worth a visit where you can find the 'Cave of the Last Judgement'. The area was occupied by the troglydites and evidence of their existence can be found here. Brantome holds water jousting contests every Friday evening during the months of July and August. The Bastille Day celebrations are held on the evening of 13 or 14 July. PERIGUEUX: Perigueux, the capital of the Dordorgne can be found on the Isle River. The town has been in existence since the Neolithic times and became an important Roman centre. Perigueux suffered thro' the middle ages and 100 year war, each of these periods left its mark on the town. Much of the construction started in the 16th century. You can see the Roman Versone Tower and remains of the Ampitheatre. The Chateau Barriere dates from the early middle ages. Saint Etienne (formerly a cathedral) was reconstructed in the 16th Century and parts of the earlier church is evident in the grounds. Perigueux boasts a medieval and renaissance centre with streets lined with medieval houses, all concentrated around the Cathedral Saint Front. In the old quarter of Perigueux one finds the sqaure where there are in the order of 15 restaurants with tables and chairs set out in the square. For those not wishing to see the sites on foot, Perigueux offers a road train to take you around the wonderful sites. SARLAT: Sarlat, correctly called Sarlat le Caneda, along with Brantome is one of the most renowned towns in the Dordogne. Sarlat is a beautifully well restored town north of the River Dronne. The old town dating from the medieval and renaissance times. It is a must to be visited especially the streets around the cathedral and those north of the old town. You will get lost in the maze of narrow lanes with something new to see around every corner. Before setting off for your walk around Sarlat, visit the Tourist Office for a suggested walking tour taking in all the key attractions. Don't forget to glance up from time to time as you explore the medieval cobbled streets as the roofs of buildings in medieval Sarlat are often in 'lauze' carefully cut stone which are unusual elsewhere. Market day is Saturday when the medieval square becomes bustling with the wares of the stallholders. Good restaurants can be found in Sarlat and the ice cream parlour in the medieval square is superb in summer. All towels are provided along with guest complimentary basket containing face flannels, soap, cotton wipes, tissues, fresh wipes, cotton buds and hairdryer. Toilet rolls are provided. Myself, my husband, son and daughter aged 11 and 14 stayed here for 2 weeks in August. Julia and Richard are very welcoming and showed us round the gite, pool area and beautiful gardens. Everything about the gite was amazing, we couldn't fault it. It was large, well equipped, the beds were very comfy and the garden was perfect. Julia and Richard are lovely and very good company, my daughter helped Julia feed her donkeys, which was the hilight of her holiday. We regularly walked into Brantome in the day and evening, via the Chemins which were very scenic. There are nice restaurants in Brantome catering for everyone and we thoroughly enjoyed watching the canoeists on the river. We went canoeing to Bordeilles, visited the Police Horses and there are lots of chateaus to visit. Sarlat and Domme are well worth a visit too. We would recommend Brantome Gite for a lovely place to spend your holidays. Wonderful, peaceful holiday in a fantastic location! I am not one for writing reviews, but I had to make an exception for the Brantome Gite. We have just returned with our 8 and 11 year old daughters from a fantastic two weeks in Brantome. The gite was immaculate when we arrived and deceptively spacious too. We met Julia and Richard upon our arrival who showed us around the property and thereafter, were the perfect hosts. We always felt they were there when we needed them but equally they let us go about our holiday without any distraction. We are regulars to the region so had a list of places we planned to visit in advance. However, we received some welcome tips from Richard about some of the places we were visiting, such as Sarlat and St Emilion. My daughters were particular pleased when they saw the size of the pool and the inflatables that were awaiting their arrival!! As other reviews confirm, Richard keeps the pool to a very high standard and that is to his credit. The gite itself is very welcoming and cosy. It was lovely and cool which was very welcome (for me anyway!) as we had some very warm weather in the middle of our stay! There is a nice, peaceful eating area just outside of the front door where we spent most of our evenings playing cards and board games with our children. It was a lovely peaceful holiday and we were devastated to leave!! 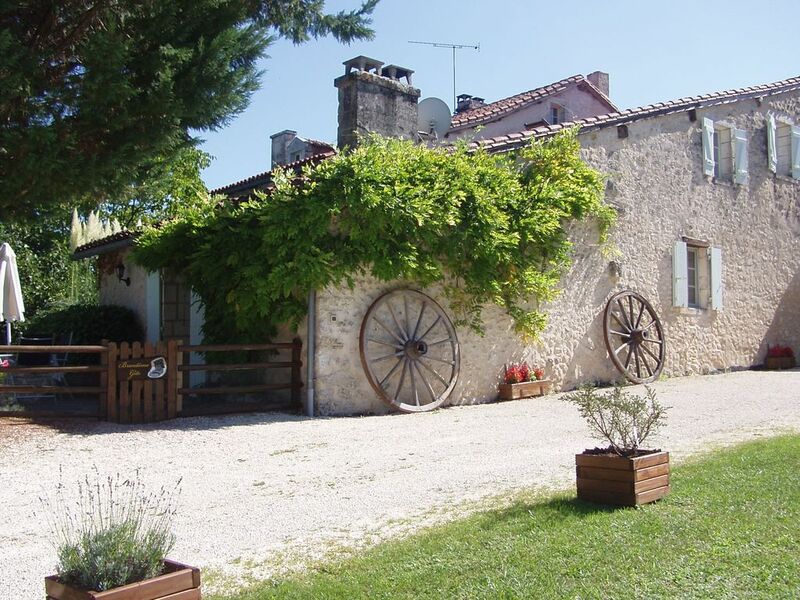 We can't recommend the Brantome Gite highly enough as both a property and destination. Thank you Julia and Richard!! A clean and well equipped gite, with an excellent swimming pool. Excellent accommodation and hosts who were extremely helpful and knowledgeable during our 2week stay. We must say the swimming pool was excellent and always in first class order thanks to Richard. An excellent place to stay especially if you like animals. Lovely spotlessly clean gite. Very comfortable beds and excellent shower. Julia and Richard are delightful and very helpful without being intrusive. Plenty of cats around and donkeys for animal lovers to enjoy. Our dog Luca was made very welcome too which was lovely. Plenty of land for him to run around safely off lead , and lots of nice walks in the local area too. A twenty minute walk through the countryside will take you into Brantome with all its restaurants and shops. Two supermarkets are also close by for stocking up. An excellent dog friendly restaurant just next door to the gite if you’re feeling lazy and not wanting to walk into the village. The gite has a lovely large swimming pool which although a bit bracing to get into is actually very refreshing. Pool towels supplied daily. A very enjoyable stay. Thank you for your review and we are pleased you enjoyed your holiday. We have WiFi verified as 5x5. All of our guests have unrestricted access to the pool at any time. Cats live in the house and not in the gite and therefore would not be responsible for your partner's allergies. Brantome the gate of the Perigord Limosin Natural Regional Park, one of the most beautiful sites in France. Brantome, known as the Venice of the Perigord is an island encircled by a loop of the River Dronne linked to the ouside world by five bridges. Its gabled bell tower, rising from the rock is held to be the oldest and one of the finest in France. The original Benedictine abbey was founded in 769 by Charlemagne. In the botanical gardens on the banks of the Dronne are the monks' exquisite little stone-carved rest-houses. There's always plenty going on in Brantome, from its annual vintage car rally and water jousting tournaments to the winter truffle market and farmers' markets on Fridays. Numerous Chateaux, Monolithic, Romanesque and lighted Roman churches are plentiful within the area along with caves, gardens and natural sites. Laying along a ley-line, Brantome is truly a romantic restful enchanting village where, perhaps when you ask - all your dreams will come true!